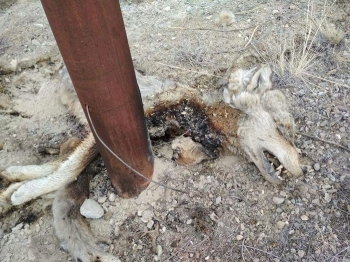 Yet in another incident of human-wildlife conflict, four Tibetan foxes and one wolf were electrocuted reportedly in February ending at Phanji La, Wanla. The incident came to light on March 6 after a social media post. A meeting was convened by WCBCL Leh on March 6 regarding the matter and expressed shock over the incident. They alleged PDD Department for their irresponsible attitude by leaving the electric pole naked and vulnerable to such an extent. Sayed Sultan, Regional Wildlife Warden said, “The incident is also been confirmed from our side so we are taking up this matter with the PDD department. As far as the case of electrocution, I believed that there was no wire that was dangling, there are some urging issue that happened with the pole so we are yet to get the on-ground factual report from our field staff". The member of the WCBCL and the Wildlife department stresses on to avoid such incidents in near future.